My friend Galen has pretty amazing luck when it comes to finding old, unseen movies. He once found some home movies of Hitler, which pretty much has to be the Holy Grail of home movie-hunting, at least until someone finds home movies of the Holy Grail. 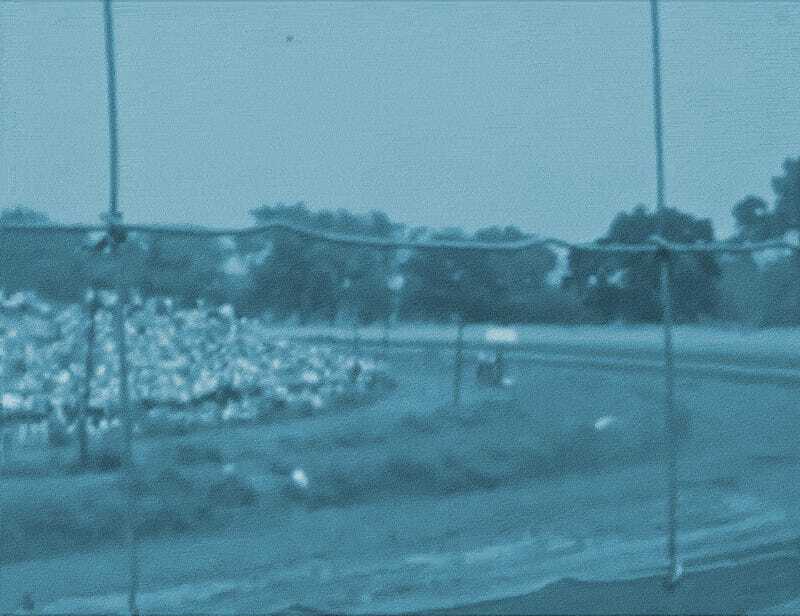 More relevant to now, though, is this amazing home movie of the 1946 Indy 500. This was the first post-war Indy 500, the race having been on hold since the war started in 1941, because wars and races tend to compete for the same sorts of resources. Most of this film is shot from the infield, but there are a few feet of footage coming into one of the turns. And there’s some good footage at the head of a parade of cars from automotive history. It takes a little while for the film maker to figure out how to shoot cars going about 114 miles per hour. But he gets the hang of it and shoots some nice shots of vintage racers. The race was won by George Robson, a British-born driver. It’s an interesting race for a number of reasons, including the first use of a radio-based communication system for drivers to talk to their crew during the race. The setup included headsets for the drivers, antennas on the cars, and a massive Raytheon ‘mobile radio telephone laboratory’ truck parked at the track. Rudolf Caracciola failed to qualify after he blacked out and wrecked during his trial. Most of the press said he had been hit by a bird in the temple. But another rumor out there is that he was shot. Rudolf was not only German, but also a member of the National Socialist Motor Corps during the war, and although he never joined the Nazi party it was close enough for a lot of Americans at the time. So did a want to be “nazi hunter” take a shot at him? There’s no proof that either a bird or a bullet hit him, he only felt a pain in the temple before he lost consciousness. but the gun theory is fascinating. That is fascinating. This is incredible footage, and the idea that it was just sitting in storage and forgotten in an antique shop for around 50 years makes you wonder what other incredible old footage is floating around out there in the big, messy world.